Andorra and Isabella had their litters towards the end of February 2019. 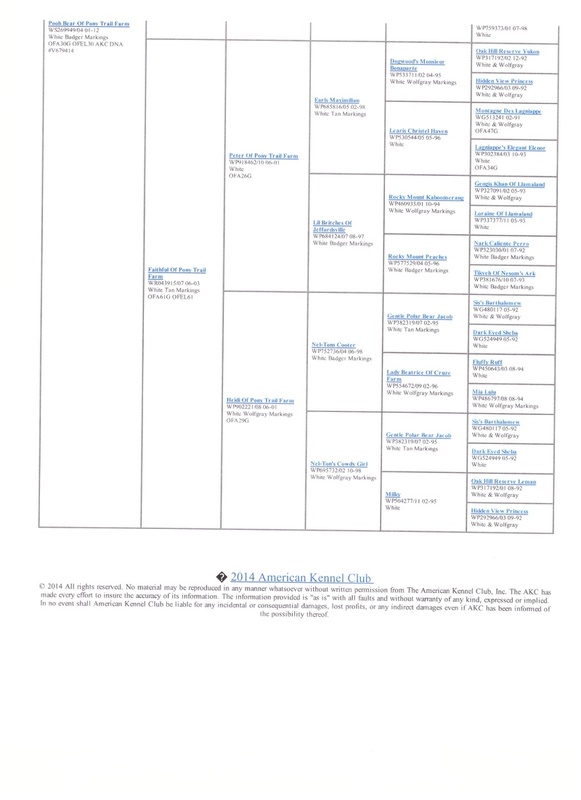 We have males and females, Full or Limited AKC Registration. Contact us for availability! Contact us below if you want to be on our waiting list, and be sure to include your email address. Next pups anticipated late fall 2019 or winter. 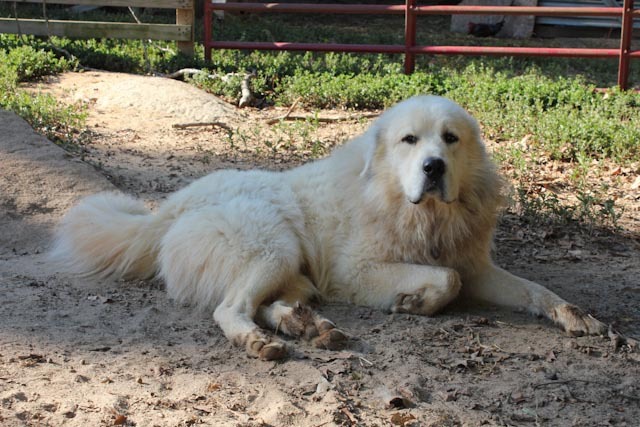 Here at Pony Trail Farm, we utilize the talents of Great Pyrenees Livestock Guardian Dogs to protect our valuable herd of goats. 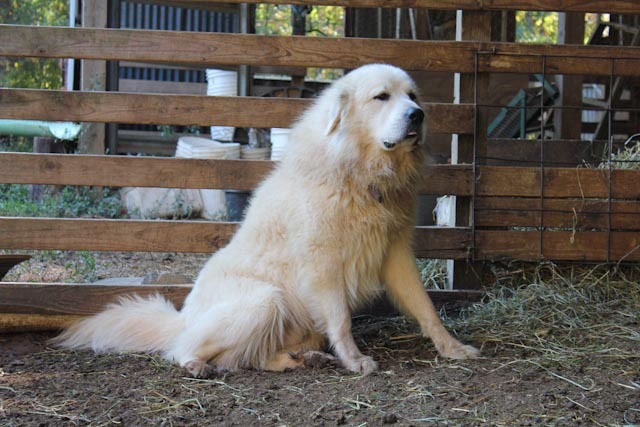 Livestock Guardian dogs have a unique skill set that is inborn. Some are better than others at their job. Many show dog breeders label and sell their culls as livestock guardians, but neither the parents or the pups have ever seen livestock! We recommend that if you are looking for a guardian dog for farm or home, that you purchase one from working parents so that there is a history of the correct temperament for the job. Our Pyrs instinctively guard the herd, and have been with the goats from the time that they were puppies. We offer a health guarantee as well as a return policy on puppies. All puppies are given their first vaccinations and worming prior to sale, and will be microchipped. 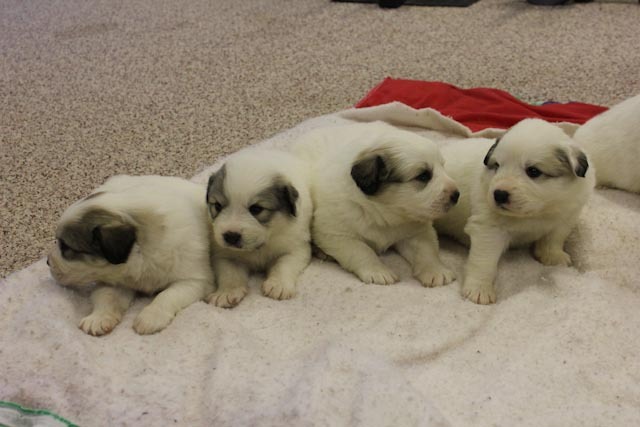 E-mail us for information about puppies currently available : Contact us : ponytrailfarm@gmail.com or 706-546-8520. 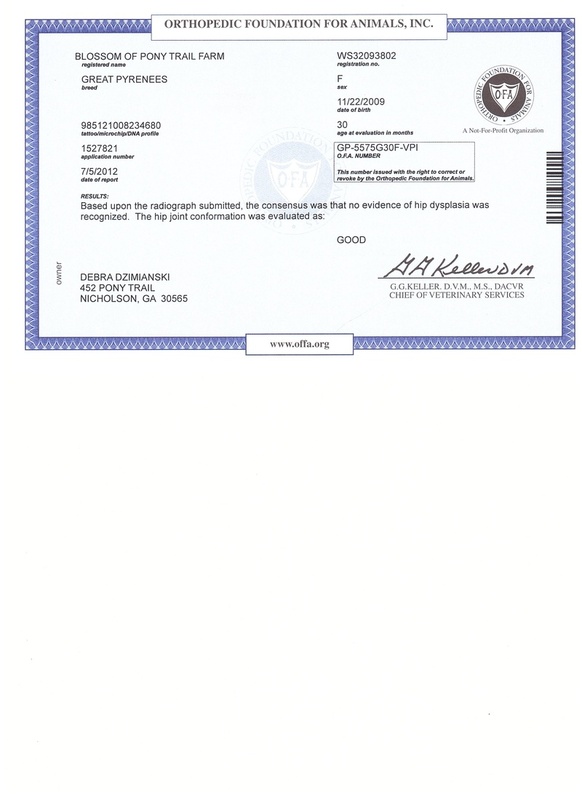 We are located in Jackson County in northeast Georgia, near Athens, and can ship via Delta from the Atlanta airport. Our breeding program focuses on AKC registered dogs with soundness of body and mind. 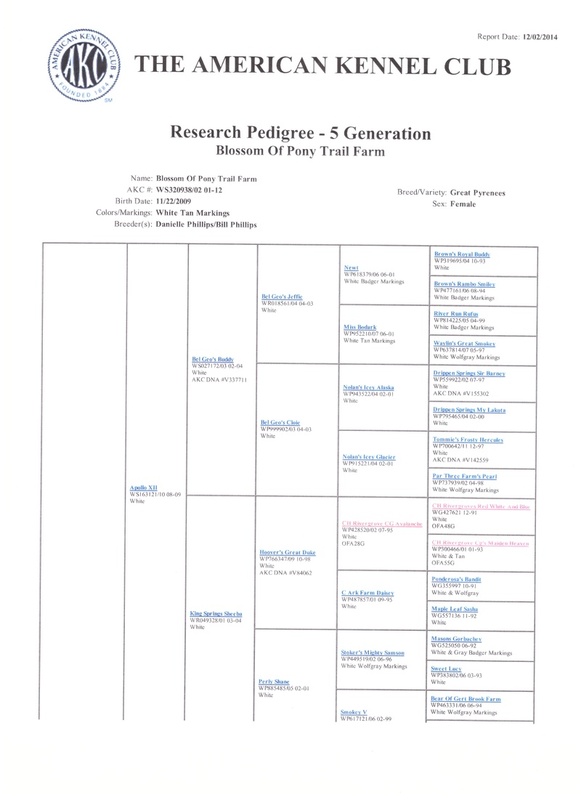 Our sire Charlemagne has been DNA identified and carries the line of our original dogs. 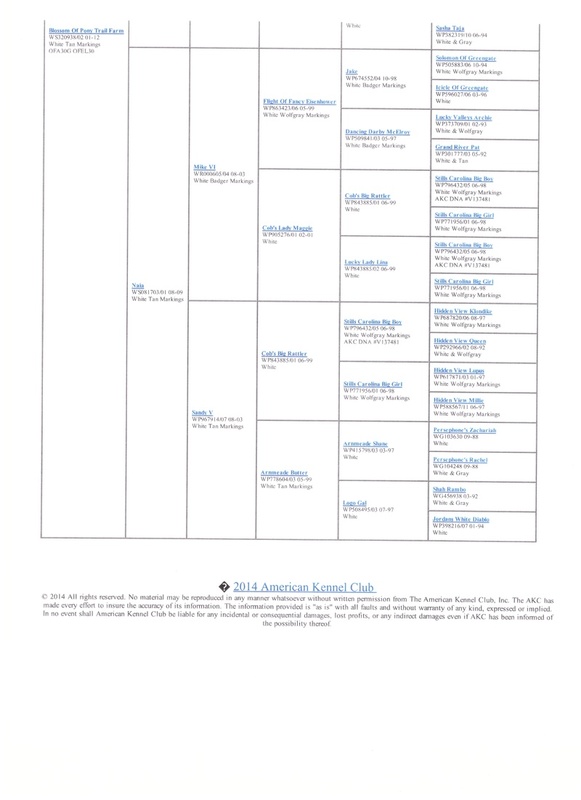 Our goal is to have all breeding stock OFA certified Good or Excellent on hips, and also normal in shoulders, elbows, and knees. 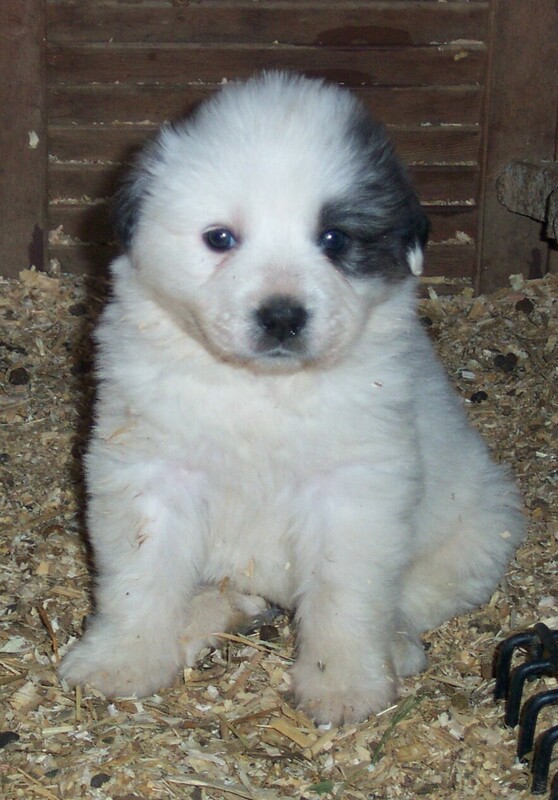 We select for dogs who will have long productive lives as livestock or family guardians. We are selecting those with a very strong bonding instinct and loyalty to the herd. We do not show, but focus on producing strong, healthy, dependable working dogs that will give many years of service. 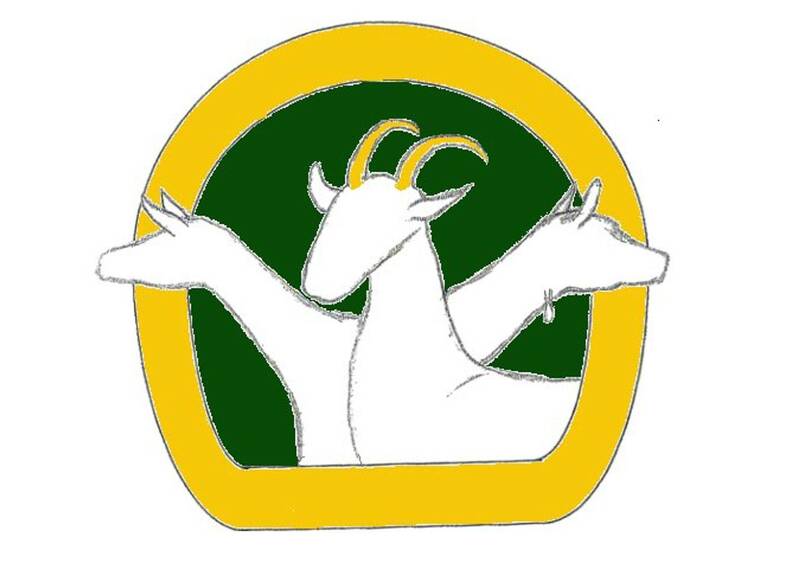 An outstanding guardian is worth his weight in gold to the farmer, and we are proud to say (and hope we will always be able to say) that we have never lost a goat to predators in the nineteen years of having Pyrenees and goats. We live in a coyote and feral-dog haven, so are very grateful to our faithful watchers of the night. On the other hand, these dogs also have to be gentle as babes with our newborn animals and with the many children who frequent our farm. "Charlie" was born and raised on Pony Trail Farm, son of Blossom and Pooh Bear. He inherited Pooh's loving disposition towards people, and is a faithful guardian. Charlie is the current sire to most of our litters. Charlie was Xrayed for OFA, and scored "EXCELLENT" on hips, "Normal" on shoulders and elbows. He still has some growing to do, but like the other dogs will be lean and muscular from activity. He is about 115 lbs. Andorra came to our farm as a young puppy, and was raised here with our goats. 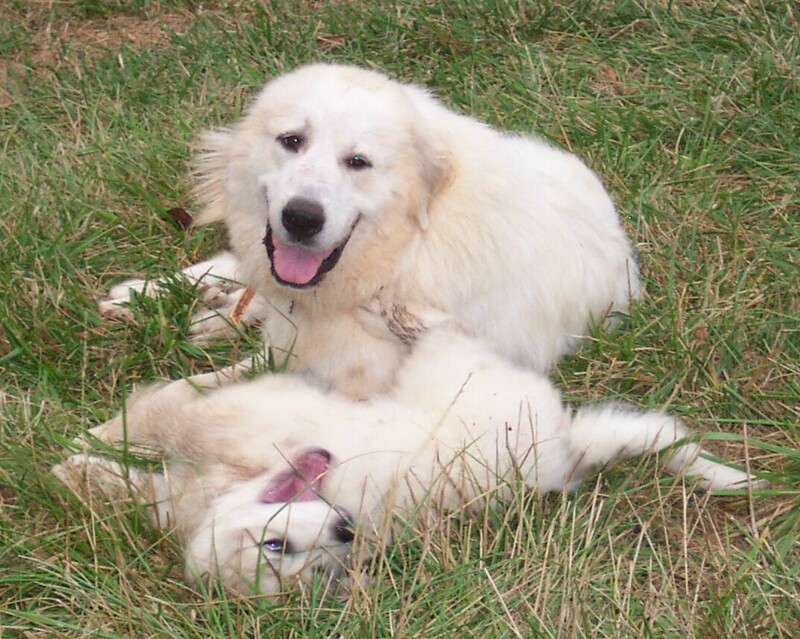 She is a quiet, gentle dog, who represents the "stockier" style of Great Pyrenees. She had her OFA Xrays at two years of age, and is OFA "GOOD" on hips, "NORMAL" on shoulders and elbows. She had her first litter of puppies in the Spring of 2017, all big, healthy, and beautiful. Isabella also came to Pony Trail Farm as a puppy, and takes her job as a guardian very seriously. She enjoys walking with the goats out to pasture in the morning and escorting them back to the barn in the afternoon. 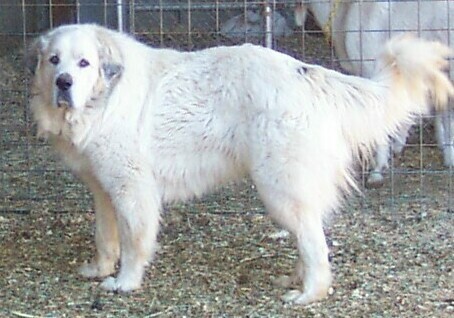 Isabella is the "taller" style of Great Pyrenees, but still has beautiful Pyr characteristics, including a nice head. She also is sweet towards people. Isabella had her OFA Xrays done at two years of age, and is OFA "GOOD" on hips and "NORMAL" on shoulders and elbows. She is the biggest of our females at 100 lbs lean weight. Annie is Isabella's sister (see above), but has tan markings instead of badger, making her look white as an adult dog. She is the same tall style, and has the same beautifully dark pigmentation around her eyes that make her eyes stand out. Annie also came to us as a puppy, works as a guardian dog and loves the baby goats, but also loves to see people. Annie is OFA "GOOD" on hips, "NORMAL" on shoulders and elbows. Just like the others, she stays lean from patrolling the pasture. Pooh Bear was a beautiful dog, taking after both his dam (Faithful) and sire (Wolf). He sadly passed away this year, leaving his legacy to his son Charlemagne. He looked like the male version of his mother and he had her loving temperament. He was OFA "GOOD" on hips and , "NORMAL" on shoulders and elbows. Blossom came to us at a year of age with her sister Holly. They had been acquired by another farm for guardian and breeding purposes, but the farm closed down, so they were offered to us at Pony Trail Farm. Blossom is the alpha female of the pack, a very sweet and energetic girl who does well with the goats and ponies. She took awhile, but has come out of her shyness towards people and is very loving and affectionate to the family. She has a beautiful doggy "grin" that I hope to catch on camera some day! Thankfully it has not occurred to her to try to escape when she is in the pasture with the livestock, and she seems content to be livestock guardian instead of family pet. Blossom was Xrayed for OFA, and we are proud to say that she passed with flying colors! She is OFA "GOOD" on hips and "NORMAL" on shoulders and elbows. She is about 26 inches at the withers, and stays between 85 and 90 pounds. Because she is an active working dog, she stays lean and muscular. Like all our animals, she is current on vaccines and parasite control. She is retiring this year from breeding but is still a strong, healthy, confident and structurally sound guardian. Wolf is our all-time favorite male and passed away at the age of 12 years, still running his perimeter to the end. He was an excellent guardian, and no matter what the circumstance, the goats were his first duty. We see these desirable traits of faithfulness and duty transmitted to his offspring. He weighed about 125 lbs and was about 30 inches at the withers. He was the most dedicated of our LGD's. He had that beautiful broad Pyr head that we love, and a strong constitution. 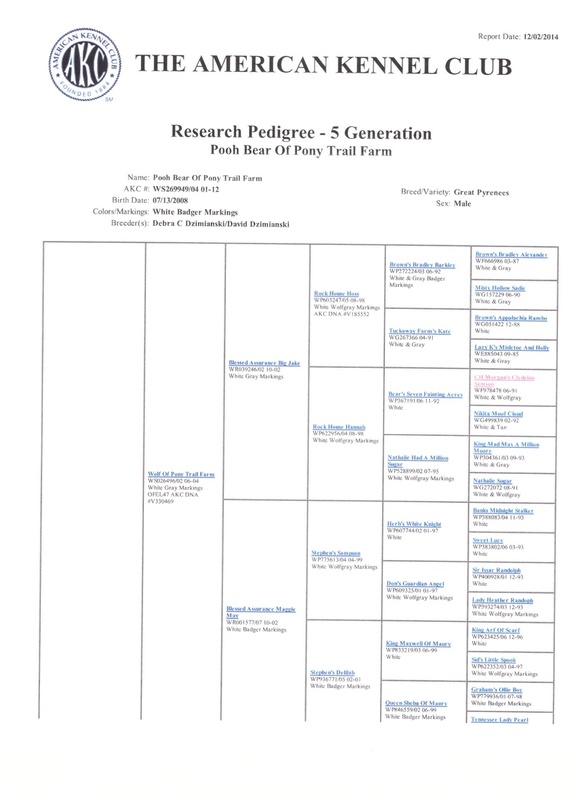 He is the sire of Pooh Bear so his genetics continue. SPECIFIC PUPPIES WILL ONLY BE HELD AFTER WE RECEIVE A $200 DEPOSIT. Promises of payment are not sufficient to hold specific puppies. If you are mailing a check, we cannot promise that your chosen puppy will still be available when check is cleared, but you will get a puppy of your chosen gender if check is received within 5 days of the agreement. PAYPAL is the preferred method of deposit, and we expect cash for the full balance at time of pickup. Puppies being shipped can be paid in full via Paypal or a personal check mailed three weeks before ship date. A bill of sale will be returned immediately upon receipt of payment. To use Paypal, go to https://www.paypal.com/home , and send payment to ponytrailfarm@gmail.com. If you have an account, you can login; if not, just click "send money" and it will direct you to credit card payment. PLEASE EMAIL BEFORE SENDING A DEPOSIT TO BE SURE A PUPPY IS AVAILABLE. DEPOSITS ARE NON-REFUNDABLE except in case of an injury or illness of your selected puppy before pickup. If no replacements are available from the same litter, your deposit will be moved to the next available litter, or you may get a refund if there is a physical problem with the pup. If you simply change your mind regarding a puppy purchase for any reason, you may bump your deposit to the next available litter (within 1 calendar year) or forfeit the deposit. PRICE: $900 includes first shots and worming and AKC papers for FULL REGISTRATION with breeding and show rights, as well as microchip. It is our discretion as to which puppies qualify for full registration as they must meet breed standard in every respect, and have a temperament that we deem worthy to pass onto future generations. 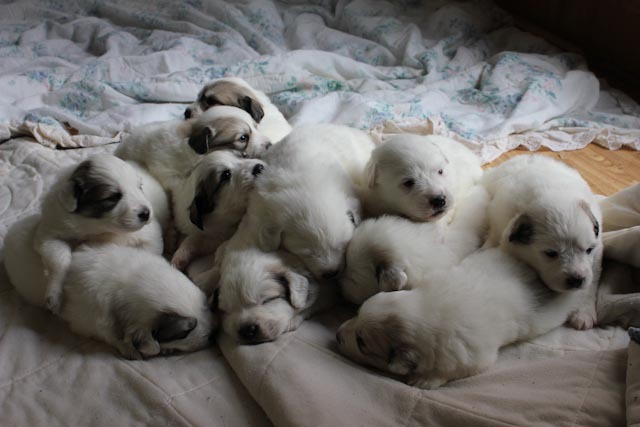 We reserve the right to assign pups based on their temperaments and conformation and the purpose for which they are sold (livestock guardians, family pet, breeding, show potential). SOLID WHITE pups meeting breed standard are sold with Full AKC Registration only, due to the high demand for this color and limited number. The FULL Registration pups are sold with a FULL HEALTH GUARANTEE which covers any illness within 3 days of purchase, genetic defect that inhibits normal function diagnosed within 1 year, and hip dysplasia diagnosed by 2 years of age (through OFA or PennHip evaluation). The warranty gives full purchase price back with return of pet or death due to genetic condition (with veterinary statement). Return transportation arrangements and costs are the sole responsibility of the buyer. Exception is loss during air travel which would be fully refunded including transportation. Some pups will be available at $750 for LIMITED AKC REGISTRATION, for pets or livestock guardians, but no breeding or show rights. These pups have Limited Health Guarantee for exchange or money back guarantee with return of pup for: infectious disease incurred within 3 days of purchase, or congenital conditions that inhibit normal working activities (not cosmetic issues) diagnosed within 6 months (veterinary statement required). The pups chosen for Limited Registration will be just as healthy and vibrant and personable as the full registration pups, without the privileges of breeding or show. PLUS Air Cargo fare for airline shipping, plus cost of crate (shipping estimate total $500 depending on puppy weight and crate size). Health certificate will be provided. Can also deliver by car for $1.25 per one-way mile within 300 miles, or of course you may pick up your pup in person. We are located in ZIP 30565. Any pups held after purchase beyond 9 weeks of age will be charged an additional $50 per week, to include extra vaccines, deworming, food & housebreaking or farm training. Pups have been fed Purina Puppy Chow for large breeds. Feed young pups 3 times daily until 4 months, then twice daily. DO NOT OVERFEED as excess can lead to orthopedic problems. These puppies are healthy at time of sale. 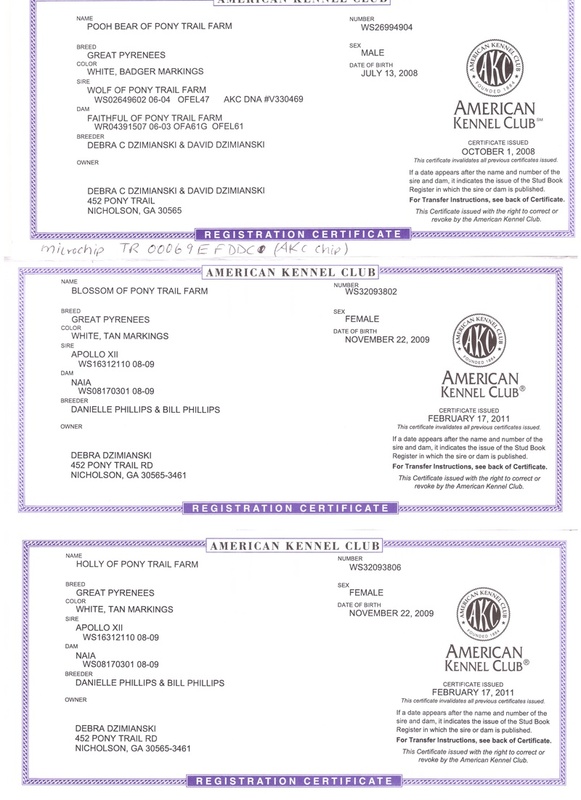 FULL REGISTRATION PUPS ($900) have a FULL HEALTH GUARANTEE with exchange or money back guarantee with return of pup for: infectious disease incurred within 3 days of purchase, congenital defects diagnosed within 1 year that inhibit normal working activities or breeding, or Hip Dysplasia diagnosed within 2 years of purchase via OFA or PennHip testing. We do NOT guarantee show conformation, performance or ability. LIMITED REGISTRATION PUPS($750) have Limited Health Guarantee for exchange or money back guarantee with return of pup for: infectious disease incurred within 3 days of purchase, or congenital conditions that inhibit normal working activities (not cosmetic issues) diagnosed within 6 months (veterinary statement required). Under no circumstances will we pay veterinary expenses after the pup leaves our farm. If your pup is found to be ill within the warranty period for a covered condition, pup should be returned for refund or exchange. If you choose to keep puppy with problem, you assume all financial responsibility and negate money back guarantee for that condition. 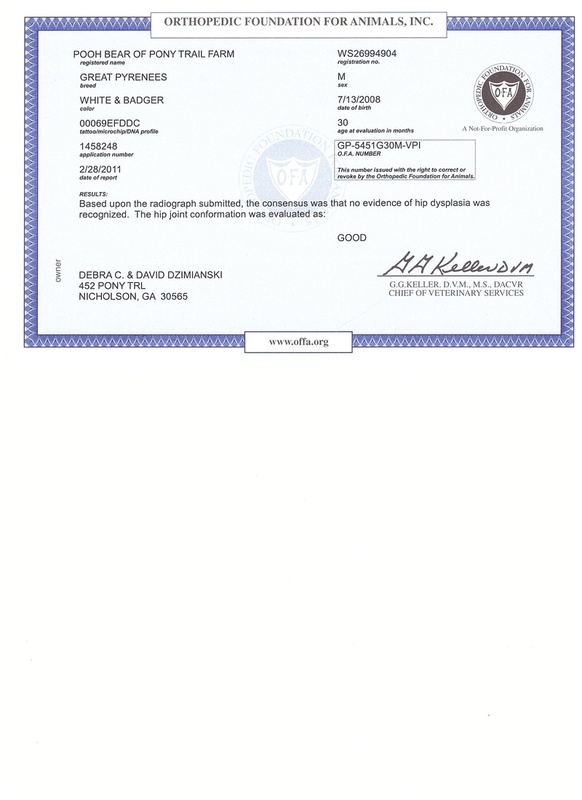 Assuming purchase at 8 weeks of age, an OFA or equivalent exam should be done on Full Registration pups at 2 years of age if warranty conditions are desired. OFA guarantee expires at that time. Preliminary readings are acceptable. Hips are guaranteed in Full Registration against hip dysplasia for 2 years with OFA reading of Fair or better. EARLY SPAY OR NEUTER BEFORE 12 MONTHS OF AGE WILL VOID WARRANTY OF ORTHOPEDIC PROBLEMS. EXCESSIVE CRATING (more than three hours during daytime hours) WILL ALSO VOID THE ORTHOPEDIC WARRANTY DUE TO ADVERSE EFFECT ON LONG BONE DEVELOPMENT. Medical reasons for return must have veterinarian's statement. Parasite control and nutritional needs require ongoing care, and warranty does not cover preventable diseases after 3 days. 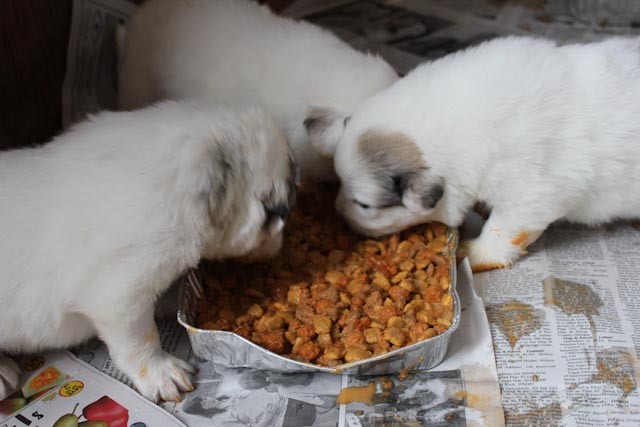 Pups will be dewormed frequently before leaving, and fecals done, but they do originate from a farm with many species of domestic and wild animals. A parasite-free pup is desired but not guaranteed due to exposure of working environment. Pups are not fully protected from infectious disease until vaccine series is complete, so care should be taken not to expose pups in public places (dog parks, public walkways, beaches, groomers, vet offices, etc), and vaccines should be done in a timely manner. A NOTE ABOUT "RUNTS"! Many people are afraid to choose the smaller puppies of the litter, thinking that the young puppy size reflects mature weight. That is generally not true - unless there is some sort of birth defect causing poor growth which would be found on veterinary physical exam. It is important to understand "gestational age". The females are in heat for about 3 weeks, and are fertile during the middle part of the cycle. They continue to ovulate all during the fertile part of the cycle, about ten days. If bred more than once during the fertile time, puppies are conceived at different times and there may be as much as 10 days difference in actual age of the pups at time delivery. Sperm can also live in the reproductive tract for up to five days, so can fertilize eggs even if no further breedings occur. The most important thing to note is that the puppies are all growing at the same RATE, i.e. Puppy #10 should weigh the same thing at week 3 that Puppy #2 weighed at 2 weeks of age, and the growth curve continually goes up at a steady rate. 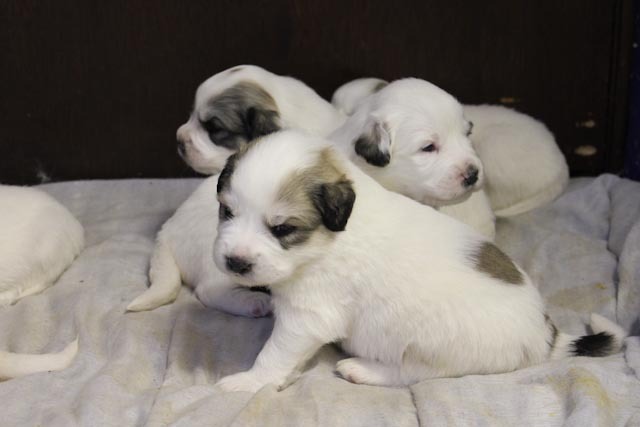 We have never yet seen our smallest birthweight puppies fail to achieve expected adult size. If sold with breeding rights, buyer agrees to responsible breeding practices, including waiting until 2 years of age with hip evaluation; exceptional nutrition, staying current on disease prevention and veterinary care, and doing health screens to maintain a healthy genetic base. If you need to place the animal for any reason after the warranty period, we will take it back with no refund, and place in a new home. If you place the dog yourself, please inform us of the transaction. 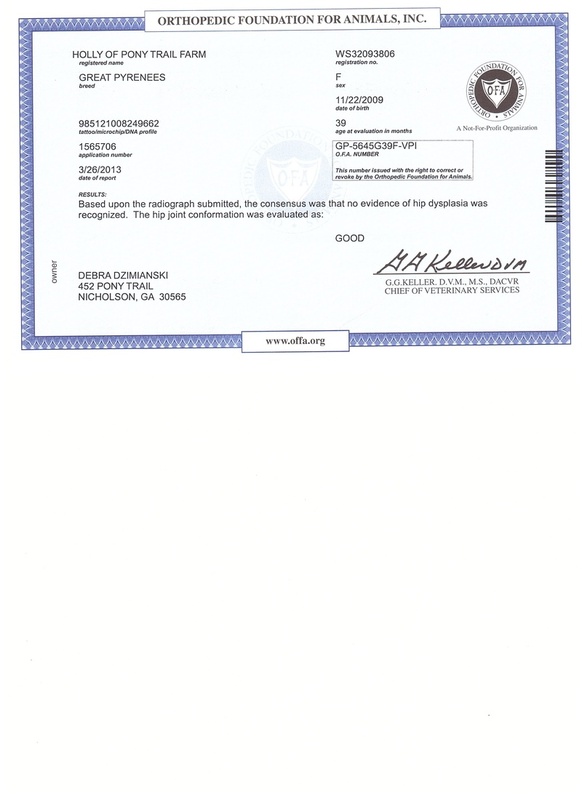 Our warranty includes exchange for equivalent value puppy if available, or reimbursement of purchase price only with return of dog or vet statement of death during the warranty period, and only for covered conditions. Return transportation costs are paid by buyer. This warranty does not cover any veterinary expenses after puppy leaves our premises. A veterinary exam is recommended within the first 3 days after purchase to confirm health. Transportation costs will be paid by the Buyer. Costs will be agreed upon between Buyer and Seller prior to delivery, if seller delivers. Any return transportation arrangements for refund in warranty period, or return after warranty period must be made by buyer.